This is the absolute best ever strawberry jam. It’s a freezer jam, which means that the flavor is better preserved — no canned strawberry taste. Yeah, it’s got way too much sugar in, but it’s fantastic. You’ll want to start with ripe strawberries. Take the caps off, then mash them with a potato masher. Make sure you have your containers washed and ready to fill at the start. I like to use jars. 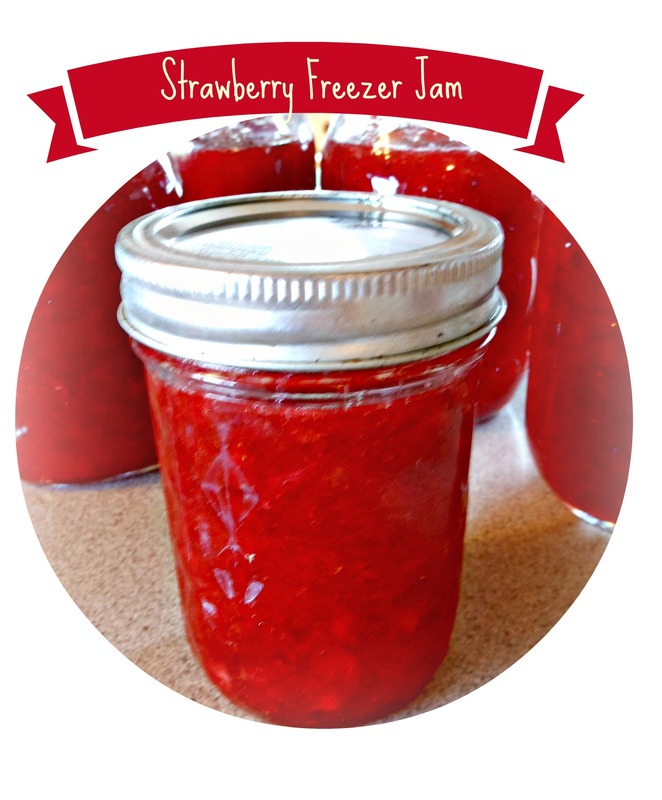 The jam looks prettier in a clear glass jar than a plastic container. And since I often forget to get it out of the freezer until right before dinner is served, I can pop it in the microwave for a bit ( I don’t like to microwave plastic). If you don’t have jelly jars, though, disposable Ziploc containers will work nicely too. 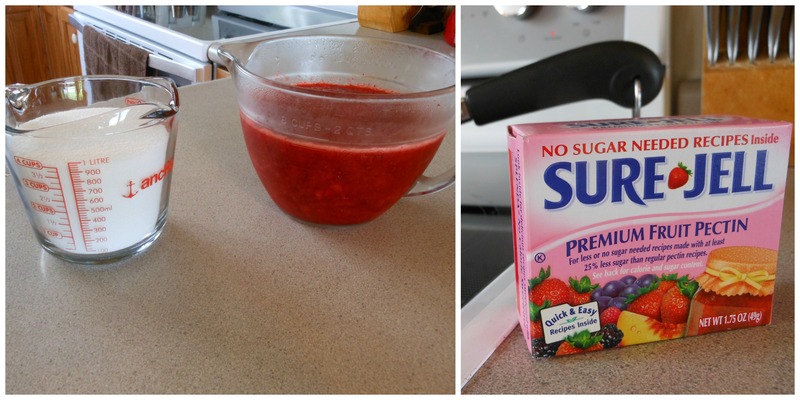 Combine 2 cups crushed strawberries with 4 cups of sugar. You’ll need to stir a while until all that sugar is dissolved. Let stand 10 minutes. Stir one package of powdered fruit pectin, such as Sure Jell, into 3/4 cup of water and heat to boiling in saucepan. Boil 1 minute, stirring constantly. Remove Sure Jell mixture from heat and immediately stir into fruit mixture. Continue stirring for 3 minutes. Then ladle into jars, leaving 1/2 in. head space. Cover and let stand at room temperature 24 hours. Then store in freezer. It makes about 5 cups. There you have it — a simple recipe for a delicious homemade jam. The most time-consuming part is capping the strawberries. The actual making of the jam really doesn’t take that long. This recipe can be found in Mennonite Country-Style Recipes and Kitchen Secrets. Previous Post Kids Love this Kind of Meatloaf! Yeah! You’re blogging again. This looks delicious. Yum! That’s our favorite kind of jam too!